Almost every blog I come across these days comes with its own food philosophy, whether it is Paleo, veganism or a diet based on eating raw foods only. Real simple food. The name of my blog and also the closest to what you might call my food philosophy. Yes, I was a vegetarian for a while, even went vegan for a while. But what really works best for me are simple home-cooked dishes, prepared from scratch with whatever I can find at the market. Real food, nothing processed, ideally fresh, seasonal and local produce, prepared quite simply. Just like this pizza. A simple dough, left to prove very very slowly while I was at work, topped with some golden tomatoes, a drizzle of good olive oil, some oregano, a sprinkle of salt and some grated goat’s cheese as well as some fresh basil once cooked. 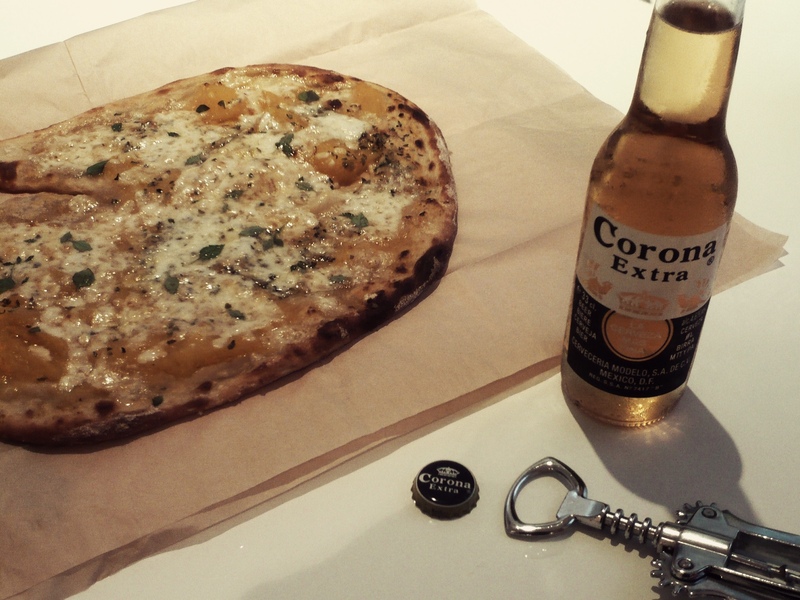 A simple dinner, served with a Corona, the perfect way to celebrate the end of another long week at work. The trick with the pizza (something Alessandro taught me) is to cook the pizza for a few minutes until the tomato sauce has cooked down a bit – that way you avoid a soggy pizza (and no one wants a soggy pizza). The second trick is the slow proving, it improves the flavour to no end and results in a crispy yet airy pizza every time. As for the recipe, it was simple really, I almost eyeballed it. I combined about 150g strong bread flour with 1/3 teaspoon of instant active yeast (a good pinch) and 115ml hot water (the hot water helps kick-start the yeast). Once combined (no worry if the mix is quite sticky), add a good pinch of salt and ca. 7g of olive oil (a tiny splash really). Combine with the flour mix. Cover the bowl with a kitchen towel and leave your dough to rise. 6-8h is probably enough for this small amount of yeast (although I left mine to prove for about 10h and it was great). Once proven, and, after folding the dough over a few times (you basically flatten the dough on a floured surface, fold the left side of the dough into the middle, fold the right side of the dough into the middle, turn the dough by 90 degrees and repeat the process) and leaving the dough to rest for ca. 30 minutes, gently stretch your dough until about the size of a dinner plate and carefully place on an oiled baking tray (the dough will be very elastic at this stage). Then simply top your pizza base with whatever you fancy and bake for about 7 minutes in an oven that has been pre-heated to 250 degrees Celsius. Hey Sophia! I love your food philosophy! I really don’t like labels. I cook a lot of paleo, vegan, vegetarian, and unprocessed dishes. But the only label I like to put on myself is that I eat mindfully. Real simple food seems very similar to that. Love it! This pizza looks good! Great tips too! Thank you! I don’t like labels either. And well done on eating mindfully – that is certainly something I still struggle with (although I have noticed that the ‘better’ I eat, the more mindful I eat … it’s when I am stuck late at work again that I start aimlessly munching crap).